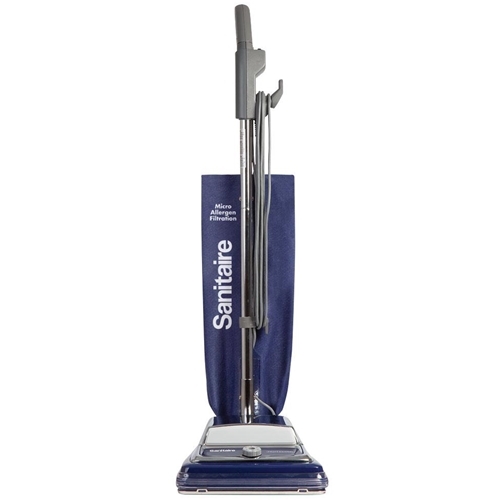 Made for deep cleaning with a 7-amp, long-life motor and multiple height adjustments, our standard models are specially designed for continuous deep carpet cleaning chores. The ball bearing steel brush roll and long power cords combine to make these uprights powerful, dependable workhorses. This highly featured upright offers a unique combination by capturing allergen sized dust particles while eliminating odors caused by mold and bacteria, leaving the room smelling fresh and clean. The unit's innovative bag design makes bag changing quick and easy. Dust Capacity 9. 5 dry qts. MSRP $599.99 but you get to pay less.